Honorees Gary Simon (left) and Felix Lichter (right) with JVC Chair Tobi Ash. Mazel tov to the Jewish Volunteer Center of the Greater Miami Jewish Federation’s 2016 Volunteers of the Year, who were honored at the April 19 Federation Board of Directors meeting. Gary Simon, recipient of the Outstanding Adult Volunteer Award, has been a dedicated volunteer for more than a decade and was nominated by Temple Judea for his outstanding work both with the synagogue and with the community at large. He is responsible for creating Temple Judea’s first December 25th volunteer event; for the wall-to-wall makeover of the JCS Kosher Food Bank with the synagogue’s Tikkun Olam committee; for the implementation of Temple Judea’s Emergency Response volunteer program; and for providing a warm and welcoming environment for all congregants and guests at the synagogue. 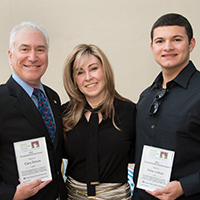 Felix Lichter, winner of the Outstanding Teen Volunteer Award, was nominated by BBYO, particularly for his work in bringing the heinous crime of human trafficking to the attention of teens across Miami. With the encouragement of Federation’s Jewish Community Relations Council (JCRC), Lichter coordinated an educational advocacy program that enabled teens to meet with a human trafficking expert. He also made it possible for teens to volunteer in the JCRC’s soap-wrapping project, which provides a vehicle for trafficking victims to call a hotline for help. He has set up collection drives for items that meet the needs of trafficking victims, and he and his peers have participated in the JCRC’s Freedom Seder. Lichter also serves on JVC’s Teen Service and Leadership Board, helping to plan and implement J-Serve and engaging more than 250 teens in service projects in one day. To learn more about the Jewish Volunteer Center and how you can participate, visit the JVC’s Facebook page, email volunteer@gmjf.org or call 786.866.8680.